A sunny day, not a cloud in the sky. Perfect riding weather, right? Think again. The temperature ekes it's way over 90 as the day wears on and wear it does as you begin to lose focus and wonder what kind of fool idea you had buying a motorcycle and riding it in heat like this. Even with your mesh riding jacket and gloves you just can't seem to beat the heat. Now what? The road to just about any summer rally is littered with the flesh and crash remnants of sun stroke victims. But taking a few simple steps, upgrading your riding gear and preparing ahead of time will keep a smile on your face well beyond 100 degrees. The rider above enjoys a ride in 90 degree heat fully geared up including a set of Bohn Armor under those black Levis. To cool off, an evaporative cooling vest under the jacket can mean the difference between an unpleasant day or a great ride. The fastest way to a sun stroke is by exposing your body directly to the sun. Your head, face, shoulders, legs and core are ready and willing to soak up as much of the sun's rays as you can throw at them and the more exposure you allow, the sooner you'll become a victim of the dreaded sun stroke. Novice riders and uneducated passengers alike think they will actually be cooler if they strip down to a tank top and a half shell or no helmet at all. It's a fallacy that takes its toll on thousands of riders every summer. You'll be far more comfortable if you cover up in full riding gear and use the preceding wisdom. And while you're at it, please pass the sunscreen. Shorts and a t-shirt won't keep you any cooler when temps go into the 90s, but this rider may go home with a hearty case of sun stroke riding dressed, or should we say undressed, like this for a few hours. In the last decade, a slew of vented and mesh riding gear has come on the market, and even so it's amazing how few people wear it. Our species is having trouble evolving away from the basic overheated 1850s gold mining pair of blue jeans sometimes hidden behind that 1860s cattle herding attire, a.k.a., chaps. As far as I'm concerned, this is simply one of the most innovative garments ever to come along for motorcyclists in this century. But first a lesson in core temp management. The best way to keep your body warm when it's cold, and cool when it's hot, is to maintain your core temp at 98.6 degrees. Repeat after me... 'the best way...' OK now let's explore how to do that on a hot day. For years, pragmatic riders were hip to the virtues of wetting down a long sleeved t-shirt and draping it over their body. Water allows heat to transfer away from your core and as you ride it's whisked away by the wind. The trouble with the long sleeved t-shirt trick is it only took about 30 minutes of dry heat and the shirt would become dry as a bone and then began insulating the heat that need needed to get out. Enter the evaporative cooling vest. Built with a quilting mass of PEF (Polymer Embedded Fibers), the vest takes about 3 minutes to hydrate fully by soaking it in water and can retain water up to 20 times longer than the old t-shirt. Your body uses the heat coming into your arms and legs to manage your core temp of 98.6 degrees. A stunning system of comfort and human ability. But what about when the air temp rises over 98.6? More recently cooling vest systems hit the market that include zip-off sleeves. When the outside air temp rises above 98 degrees, simply affix the sleeves to the vest if it has the option and the good times keep rolling right into the 100s. What if you add the sleeves below 98 degrees? At that point you'll lessen your body's ability greatly to manage the core temp and you can actually drop your core temp below 98.6 which can provide you with unpleasant flu-like symptoms including dizziness. Imagine riding through the desert and shaking with the chills. Bad idea. You may want to find a way to affix a trustworthy thermometer to your bike so you can monitor the outside air temp, but personal experience has shown that every time I felt the compulsion to add the sleeves, low and behold the air temp was right at 98. No thermometer required. The pituitary gland is fascinating. 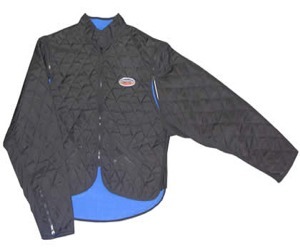 Finally, it's important to understand that the vest is going to do far more good when worn under a leather or textile riding jacket with the vents open, than worn as the outer layer of your riding attire (sans jacket). With air flowing around the vest while inside a coat, the vest will stay wetter longer. When worn alone without a jacket it will dry out faster than necessary and not provide the optimal cooling ability for long at all. A synthetic wicking t-shirt will do far more good than a stuffy old cotton t. The beauty of polyester synthetics such as intera yarn, rayon and others is that they wick excess heat away from the body, making them a perfect garment when worn alone under your jacket on a hot day or an excellent transfer vehicle when worn between your body and an evaporative cooling vest. The other advantage to a synthetic wicking t is that eventually the air is going to cool down. Whether you're heading up into a cool mountain pass or the day is ending at some point, you'll want your t-shirt dry. For a wet cotton t that may not occur soon enough and then swing you the other way by having a wet shirt draped over your body when outside air temps drop into the 70s or below. Not good medicine. Synthetic wicking t's typically dry out three times faster than natural fibers, allowing you to manage your core temp better. One final advantage of a good synthetic wicking t is that they typically pack much smaller. What's that funny Padded Wicking Skin on my bottom? Ditto on everything you just read above about the t's with an added bonus. Padded wicking skins, like those made by Andiamo!, feature a chamois pad in the crotch. While some think this is for general comfort, the real reason is that the pad provides additional wicking where you're going to need it most on a hot day. They feel a little funny at first, but after a few days and a few hundred miles you'll hardly notice them, until the next time you don't wear them. Ditto on all that previous wicking wisdom again, but since the feet are likely to funk due to the fact they're trapped without much air circulation, we need to add a little anti-microbial properties into the mix. There are various forms of this on the market. Most garments that claim to be anti-microbial are simply sprayed with a solution during manufacturing that over time washes out in the laundry (which we will discuss shortly). The one sure-fire anti-microbial is a natural element and will follow you wherever you go as long as you own the garment. What you're looking for in socks are those made with a synthetic thread spun with silver added into the blend during production. Not just in the case of motorcycle boots, but most shoes in general don't come with much of an insole. Few breathe very well and most won't wick heat away from the body. Upgrading your boot insoles to a thin sole that is form fitting and heat wicking will do wonders in keeping your feet from overheating. Quality foot powders are designed to absorb moisture, soothe, refresh and relieve itching and burning feet. Using them when you ride is one more way you can reduce overheating scenarios on the road. The last three pieces of advice on the feet produce some stunning results when used all together. If this rider cares enough to protect his head with a full face helmet, he might be interested to know that with today's technology he can protect the rest of his body on a hot day and still be comfortable - for a little more than the cost of a full face helmet..
We hear it all the time - be sure to drink lots of water. And you should, at least a few liters a day while in the saddle. How you choose to do it is up to you. Some like to use a bladder system like a CamelBak, others are content enough just sucking down a few ounces at each stop. However you do it, do it. The oxymoron here is that you can get electrolytes by way of those fancy energy drinks, that surprisingly are full of sugar and oftentimes caffeine, both ingredients that lead to dehydration. Gatorade, Red Bull, PowerAde and others do more harm to motorcyclists than good - especially if you're diabetic. There is a way to get pure electrolytes into your system without all the junk. Recently a mineral company in Utah, Mineral Resources Incorporated, introduced an Electrolyte add-in to the outdoor market called Elete. While most sport drinks only include two needed electrolytes at best, sodium and potassium, Elete utilizes four with the addition of magnesium and chloride. You won't find vast amounts of sodium in the product since it's assumed you're already getting plenty of that in your next order of fries. Once you step off the bike, you'll still want to beat the heat. 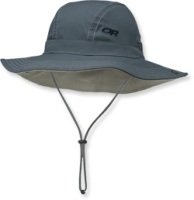 A flexible hat with a full brim (not a baseball cap) will insure you keep the sun's rays off your face and head should you need to fix a flat, take a long break, spend some time at a roadside attraction or dine outdoors. Being flexible, it will slip nicely into your tank bag without being a nuisance. We've talked a lot about synthetic fabrics here. It's critical to launder them properly in warm, not hot water, and by not using everyday laundry detergents. Instead, reach for a product like Dreft (baby soap) or Nikwax's Base Wash. Normal detergents leave residues behind that clog synthetic pores, reducing their ability to wick heat and moisture. The two above-mentioned cleaners rinse out pure leaving behind no residues. The latter, Nikwax, has anti-microbial properties of its own not found in Dreft. It's also important not to add fabric softeners in the rinse or use dryer sheets with synthetics. Okay, so now you're an expert about keeping your cool on hot days, but that doesn't mean the others you're riding with are and you may have a few fellow riding pals who are still of the mind that they can strip down to a tank top for best results. If you're planning any rides in the near future, feel free to pass this article along so everyone knows all your tricks, thus reducing the chance that you'll be dealing with someone else's sun stroke on the road. You'You'll find a number of the items mentioned in this article in the Sound RIDER! online store under the Ride Cool category . For jackets, helmets, boots, pants and gloves please shop your better stocked local dealer .